Welcome to the island paradise of Key Largo, the first of the Fabulous Florida Keys and the Dive Capital of the World, where you can kick off your shoes and leave your cares behind. Key Largo is home to the worldâ€™s largest artificial reef, the 510 foot USS Spiegel Grove, the John Pennekamp Coral Reef Experience the Spiegel Grove â€“ without getting wet! Click Here for Short Movie (5 mb) Click Here for Long Movie (21 mb) (requires Quicktime player) Underwater State Park, the African Queen and the famous Christ of the Abyss underwater statue. The Everglades National Park is just a short trip away by boat or car. Diving, snorkeling and glass bottom boating in our clear waters of the Florida Keys National Marine Sanctuary is a fantastic experience. Opportunities to fish our backcountry or deep sea abound. Watersport activities are plentiful and for the nature lovers, there is kayaking, swimming with the dolphins, air boat rides and everglades tours. Or, just relax with a tropical beverage and do nothing at all but watch our beautiful sunsets! 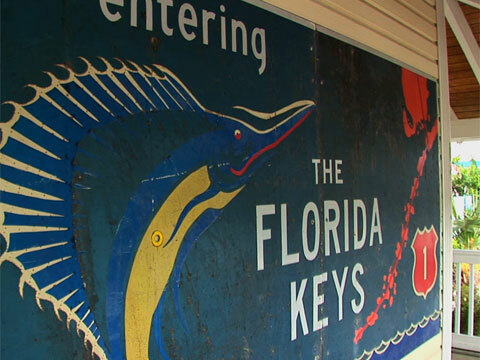 Accommodations in Key Largo range from full-service resorts to small individually owned motels, all are known for their relaxing atmosphere and ambiance. The islandâ€™s campgrounds are scenic and friendly with tent and full service RV sites. These pages are hosted by the Legendary Key Largo Chamber of Commerce. If your are ready to visit or relocate to the island of Key Largo you can give us a call for our â€œGuide to Island Livingâ€ booklet or additional information at 1-800-822-1088 or email us at info@keylargochamber.org. Check out our membership directory for all types of businesses in the Upper Keys! For a complete list of members please see our membership directory. For a complete list of our Board Members, please see Board Members directory.